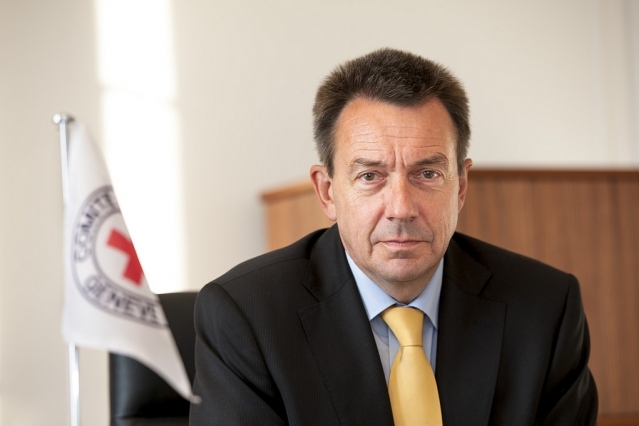 Washington DC – The President of the ICRC Peter Maurer has wrapped up a four-day visit to Washington DC, where he met the following officials: National Security Advisor Susan Rice; Secretary of Homeland Security Jeh Johnson; Director of the Central Intelligence Agency John Brennan; Deputy Secretary of State Tony Blinken; Principal Deputy Under Secretary of Defense for Policy Brian McKeon; Assistant Secretary of State for Population, Refugees and Migration Anne Richard; Senator Ben Cardin (D-MD); Senator Bob Corker (R-TN); and Senator Chris Murphy (D-CT). He also met Managing Director and Chief Administrative Officer of the World Bank Group Shaolin Yang and President and Chief Executive Officer of the American Red Cross Gail McGovern and members of her International Services team. During his visit, Mr. Maurer engaged with officials on the impact of US military operations on civilians and he discussed the US detention facility at Guantanamo Bay as part of the ICRC’s ongoing confidential and bilateral dialogue with the US authorities on protection-related matters. He also discussed migration in the Americas with the US Department of Homeland Security. Mr. Maurer says now is the time for all nations, including the US, to reaffirm their commitment to ensure better global respect for international humanitarian law and to reduce the vast human suffering caused by armed conflict and violence worldwide. “We need innovative solutions, new thinking, more agility, and enhanced partnerships and cooperation between governments, aid agencies, international financial institutions and the private sector in order to deal with the systemic consequences resulting from today’s wars and violence,” he said, adding that he hoped the World Humanitarian Summit taking place in Istanbul next month would provide an opportunity for world leaders and humanitarian actors to do just that.